That's odd; I'm sure I saw a spec on the Broadkaster showing 25.5. I'd get a used Panther,the red one i played a few years ago was outstanding,i only wish i could've brought it home. The lacquer thing wouldn't bother me though,this guitar is a class act. You also have the new Player's Edition Broadkaster 6609,with or with out Bigsby. Is the neck angle on the Broadkaster such that it has to have a tension-bar Bigsby? Normally when there is not a floating bridge you need a tension bar. I noticed the bridge/Bigsby thing as well... seems that'd be another point in the favor of the Panther, that and it seems that the wooden feet of the bridge might do some things to tone that Iike. BobL - Take another look as the bridge is connected directly to the body. It does not have the wood underneath it. Yes, on the Broadkaster - I was referring to the Panther having a pinned-floating bridge, and that being a point in favor of the Panther. And that’s a more conventional Gretsch construction, as is the higher neck angle on the Panther. But both features move the Panther away from typical 335 design. Which is fine. I’d have to have both guitars in hand to determine which sonic result I preferred. I’m agnostic about the construction details from an aesthetic or, in this case, even a functional point of view. I know what both should contribute - and which bend the design closer to 335 or more typically Gretsch practice. But the brief here is to find the ideal Gretsch-335 hybrid, and I wouldn’t be sure I’d found the ideal point on that continuum for my taste till I actually heard it. But if one knew he wanted the whole classic 335 experience in a Gretsch, I’d think the stud-mounted bridge and lower neck set would be fundamental. Also, don’t discount the new ‘Trons in the Broadkaster out of hand. From the description, I would have too - but the most vocal proponent of the Broadkaster on the GDP (senojnad) is a guy whose long experience, ear, and opinion I trust implicitly, with a clear bias for clean, rich, balanced and Gretschy tone. He loves the pickups, and I just can’t imagine he’d endorse mid-pushed gainy (or muddy) pickups. Not his thing. Bingo! You captured my thoughts precisely, Proteus. My early experience with my Broadkaster and its Full'Tron pickups had me thinking "time to chat with TV Jones...." HOWEVER -- a fresh set of strings and logging more hours with the guitar has changed those thoughts. I'm finding several excellent tones supported by the treble bleed circuit and no-load tone pot. My standard for comparison is my '59-6122 (10+ years ownership). This is NOT to say they sound the same -- they do not. I'm comparing my perceived tone qualities -- I like both very much. This is not to say the Full'Trons will "never" be replaced. At present I am enjoying them and have no plans on replacements. Curious if you/anyone has played both the Broadkaster and the Panther and has any thoughts. Enormously difficult for me to try before I buy living in Wyoming. Wildwood down in Colorado carries some of these, but doesn't appear to have any Panthers in stock or to regularly stock them at all... also doesn't have any Bigsby Broadkasters. I'm sorta leaning towards Broadkaster, and see how I like the pickups. If I determine I want to swap into some TV classics, I can pull the gold ones from my 6120 and put them in there, and get some nickel ones to put in the 6120, as the pickups are the only gold hardware I haven't replaced w/ nickel on that guitar. Laminate thickness - is this real thick like a 335, or thin like a 6120? Acoustic resonance - do these feel more resonant, and are they louder unplugged than a 335? I know nothing about the newer models, but the fat heel area of a double cut 6122 , 6120, or Falcon is the main thing that gets in the way of upper access. That's what the 335 doesn't have that allows you almost unlimited reach. I'd also say the Gibson pickups are going to sustain a little more. I had a '68 Streamliner that was built a lot like a 335 once. It had two hot Supertrons. Those Supertrons were hotter than the first ones used on the Chet models. It was a fun guitar to play. It was just like a Monkees model without their logo. Might be hard to find one in that they didn't make that model very long. I have a 2013 Gibson ES335 and a Broadkaster Jr.
Not sure what you mean by "real thick" -- the top surfaces on my two guitars feel the same. Acoustic resonance -- also about the same. Well, measured with calipers at the F hole, on my 335 the laminate for the top is 3/16" thick, while on my 6120 the laminate for the top is 1/8", so, the 335 is 150% of the thickness of the 6120, and I'm wondering if the broadkaster is the same thickness laminate as the 6120. With the Jr, I would expect it to be quieter than the non Jr, since the body is smaller. I ask, because while they are all electric guitars, the resonance a liveliness of the body is a big part of what I love about the sound of the 6120. I think between the maple center block and the extra thickness of the laminate used for the 335, it becomes very much like a solid body guitar, and while some of that is good, if I replace it, I'd like to replace it with something that skews more towards the hollow body sound than the 335 does. Spec wise, it seems the Gretsch center blocks do skew more that way, but I'm wondering how pronounced it is, because I would hate to go to the trouble to replace my 335 with filtertrons with... a 335 with filtertrons. It's likely worth a trip to Colorado to actually play one and see for myself. The top of my ES-335 is 5/32", the top on my Broadkaster Jr. is 3/32". I assume you're talking about Wildwood Guitars, near Denver -- ?? That should be an excellent place to do some good A/B comparisons. Looks like they have a Broadkast Jr. in stock and they usually have several Gibson ES-335's. Never been there but my son-in-law (lives in Denver) has been on several occasions. Apparently it is a relatively small shop with a BIG (separate) warehouse. Probably a good idea to call ahead to give them details on pieces you want to try so they can pull them from stock and have them available for you. Yep, Wildwood - I have been there many times and have bought a number of guitars from them over the years. I actually lived about a block and a half from them from 2000 - 2005. Great shop - I have always called ahead and I show up and they have guitars waiting for me. They appear to have both a Jr (not something I'm interested in) and the non-Bigsby large body Broadkaster. Wish they had a Panther in stock... I'm starting to lean more heavily in that direction because of the floating bridge, B3 and lower output pickups. The guy who demos stuff for Musician's Friend (who's videos I love, because he plays more like a normal person vs. Greg Koch, and typically uses the same gear/amp for all his vids) has these vids of the Broadkaster and the Panther, and the Panther definitely wins out for me on tone... though a great deal of that is pickups. I saw in a thread that you are bypassing the tension bar on your Jr, which I've heard of other people doing - are you still happy with that setup? I did not "bypass" the roller bar. I installed a BricksBiggsFix which replaces stock B7 roller bars at a higher level which reduces the break angle behind the bridge. It has worked extremely well and I'm totally satisfied with it. On some guitars people have bypassed the roller bars by simply running the strings over the top of it. That will not work on Broadkaster Jr. models. The strings would be too high -- little or no contact with the bridge. Ah, right. That was the first time I'd seen that particular approach - clever. Really thinking a Panther is probably what I'm after... which is sorta funny - I originally came to this forum looking for info on a Panther to compliment my 335, and y'all talked me into the 6120 - which I'm super happy with... now, full circle. 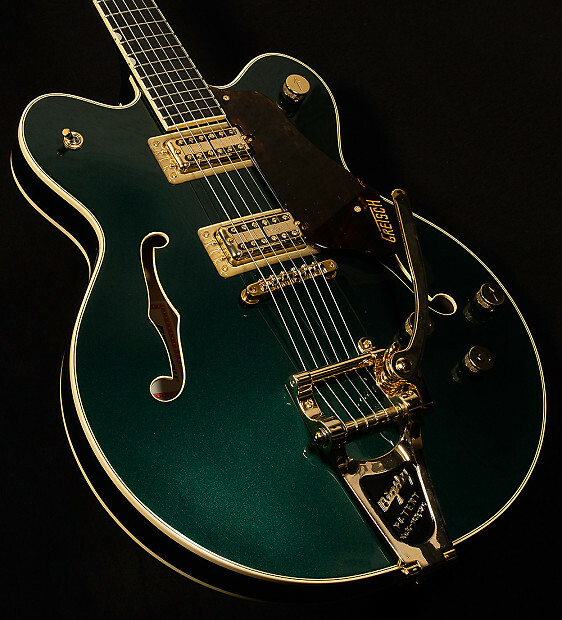 So in the end, you don't really want a Gretsch 335...you want more of in-between hybrid. Nothing wrong with that! The Panther's a dandy. Yeah, I never wanted a 335... I have a 335 that I'm unhappy with - I want a Gretsch with some of the features of a 335 - thinner body, better upper fret access. I think the floating bridge is part of what I dig about the feel of the 6120, so... Panther makes a lot of sense. I’m with you. It’s been a great exercise in feature analysis. I’m intrigued by the shadings on either side of the same dividing line, and am probably headed toward one or the other permutation myself. I have thinline Gretschs with floating bridges, and one Electromatic centerblock. Don’t know whether I’ll land on a Panther/Falcon with block and floater - or the whole 335 Broadkaster enchilada. I was a 335 guy for years before falling down the Gretsch rabbit hole - so the idea of a full-on Gretsch 335 still appeals. You know, if you came to a Round-Up you would have all sorts of Gretschy goodness to try. You could attend the one at Camp Lodestar in Wilseyville, California from September 14-16. You would probably want to fly into one of the nearby airports in the Bay area or Sacramento.